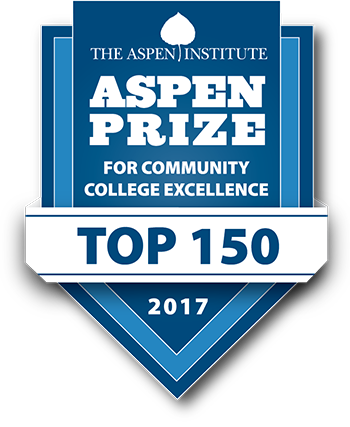 Highlighting the critical importance of improving student success in America’s community colleges, the Aspen Institute College Excellence Program recently named Cowley College as one of the nation’s top 150 community colleges. The Aspen Institute College Excellence Program is the nation’s signature recognition of high achievement and performance among America’s community colleges and recognizes institutions for exceptional student outcomes in four areas: student learning, certificate and degree completion, employment and earnings, and access and success for minority and low-income students. Nearly half of America’s college students attend community college, with more than seven million students – youth and adult learners – working towards certificates and degrees in these institutions across the country. Cowley College and the other community colleges on the list were selected from a national pool of over 1,000 public two-year colleges using publicly available data on student outcomes in three areas: performance (retention, graduation rates including transfers, and degrees and certificates per 100 full-time equivalent students), improvement (awarded for steady improvement in each performance metric over time), and equity (evidence of strong completion outcomes for minority and low-income students). The Aspen College Excellence Program aims to advance higher education practices, policies, and leadership that significantly improve student outcomes. Through the Aspen Prize for Community College Excellence, the New College Leadership Project, and other initiatives, the College Excellence Program works to improve colleges’ understanding and capacity to teach and graduate students, especially the growing population of low-income and minority students on American campuses. The Aspen Institute is an educational and policy studies organization based in Washington, DC. Its mission is to foster leadership based on enduring values and to provide a nonpartisan venue for dealing with critical issues. The Institute is based in Washington, DC; Aspen, Colorado; and on the Wye River on Maryland’s Eastern Shore. It also has offices in New York City and an international network of partners.